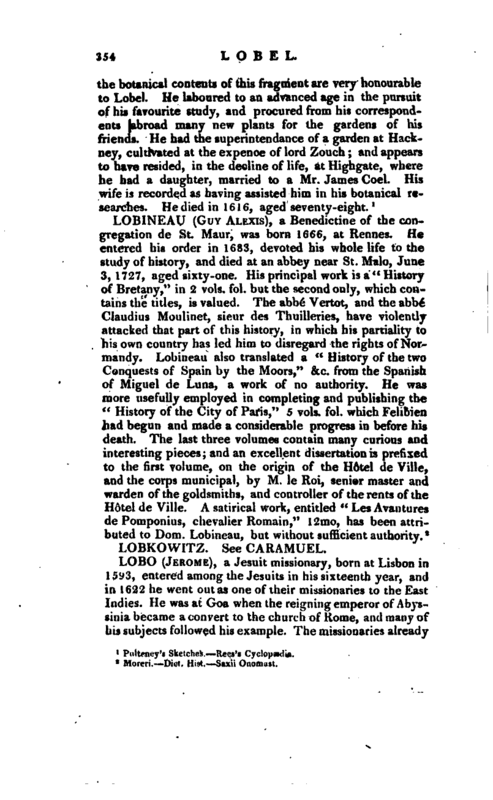 , or L'Obel (Matthias de), a botanist, was born in 1538, at Lisle, in Flanders, where his father practised in the law. 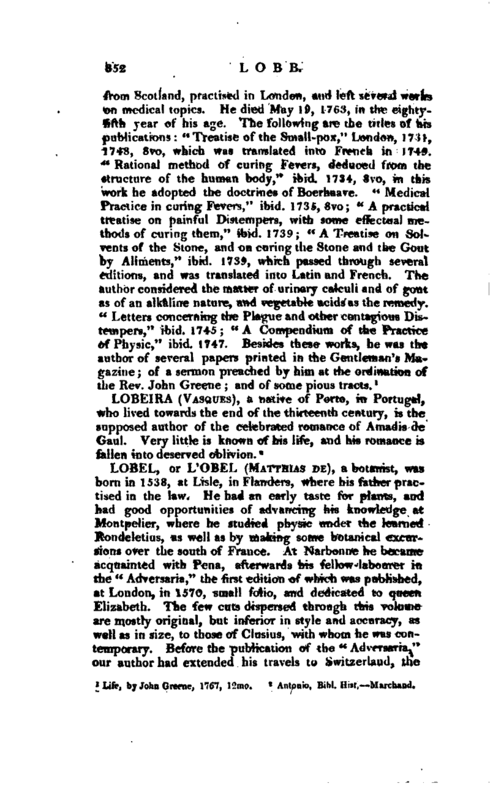 He bad an early taste for plants, and had good opportunities of advancing his knowledge at Montpelier, where he studied physic under the learned Rondeletius, as well as by making some botanical excursions over the south of France. At Narbonne he became acquainted with Pena, afterwards his fellow^labourer in the “Adversaria,” the first edition of which was published, at London, in 1570, small folio, and dedicated to queen Elizabeth. The few cuts dispersed through this volume are mostly original, but inferior in style and accuracy, as well as in size, to those of Clusius, with whom he was contemporary. Before the publication of the “Adversaria,” our author had extended his travels to Switzerland, the | Tyrol, some parts of Germany, and Italy; had settled as a physician -at Antwerp, afterwards at Delft; and had been appointed physician to the illustrious William prince of Orange, and to the States of Holland. Dr. Pulteney has not been able to ascertain the time of Lobel’s removal to England, but justly concludes it to have been before 1570, or most probably some years earlier. The aim of the authors of the “Adversaria” was to investigate the botany and materia medica of the ancients, and especially of Dioscorides. It was reprinted at Antwerp in 1576, the dedication being, of course, there suppressed, and new titlepages were printed to help the sale of the original in 1571 and 1572. Some copies of the Antwerp impression appear to have been made up into a new edition at London in 1605, with an ample Pharmacopeia, and an appendix. 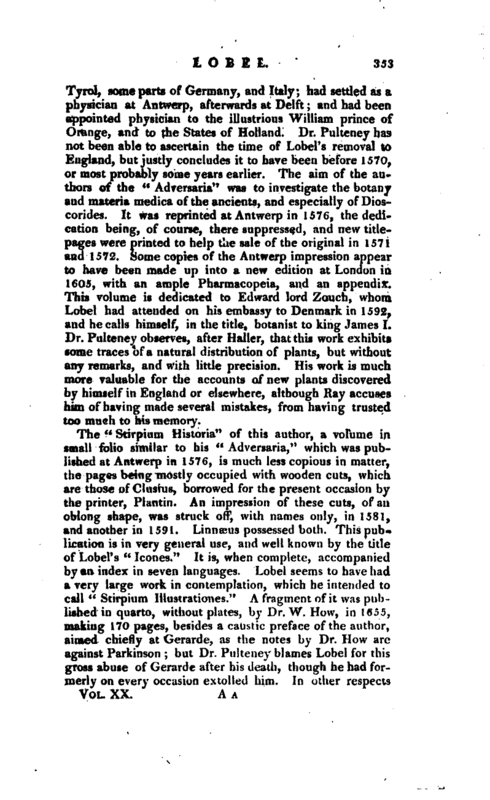 This volume is dedicated to Edward lord Zouch, whom Lobel had attended on his embassy to Denmark in 1592, and he calls himself, in the title, botanist to king James I. Dr. Pulteney observes, after Haller, that this work exhibits some traces of a natural distribution of plants, but without any remarks, and with little precision. His work is much more valuable for the accounts of new plants discovered by himself in England or elsewhere, although Ray accuses him of having made several mistakes, from having trusted too much to his memory.